Yahoo: Two new DALSA High Quanta sensors with resolutions of 1044 x 1044 (IA-DJ-01044-00-R) and 524 x 524 (IA-DJ-00524-00-R) feature the same 24 um size pixel. The new sensors are said to employ the latest designs in output amplifiers providing low noise at high data rates. The sensors are available now and will be showcased this week at the Radiological Society of North America (RSNA) Show. For applications demanding UV sensitivity and > 90% QE, back side thinned (BST) devices will be available on a custom basis. The standard front side illuminated product's QE is said to be peaking at more than 70%. Vol. 54 of Sony Semiconductor's quarterly magazine CX-News presented 3MP, 5MP and 8MP CMOS sensors based on 1.75um pixels. The whole family is targeted to camera phone applications. 3MP IMX029 and IMX058 differ by the interface type: IMX029 has serial interface while IMX058 has parallel one. 5MP IMX034 and 8MP IMX043 have conflicting data on their interface: the header claims they use parallel one, while later in the text both are mentioned as having serial sub-LVDS interfaces. 8MP IMX043 is able to operate at 15fps speed at full resolution. The sensors use 0.14um 1P4M Cu process, which allowed for an increase in chief ray angle, as compared with the 2.5um ancestor pixel. Magnachip applications US20080283885 and US20080283886 talk about saving a reset transistor in 4T pixel by substituting it by a diode built vertically above the substrate. 20080283886 pixel also uses JFET as a source follower transistor to reduce the noise, while 20080283885 pixel has a set diode, in addition to the reset one. The reset and set diodes are formed between the diffusion and poly, amorphous silicon, local epi-layer or metal (Schottky version). Probably, JFET was thrown in 20080283886 to improve its chances to be granted, as when each idea separately would be rejected (there is a good chance they would), it still might pass as a combination. The set diode in 20080283885 application improves the reset operation of the reset diode by biasing both at slightly different voltage, so that a small forward current flows through the diodes, keeping floating diffusion at mid potential. Sony application US20080284250 talks about 3-level power supply for powering transfer get of 4T pixel. 3 levels are used to reduce image lag and noise, but it creates a number of start-up problems in mobile device, where the highest voltage might be not available initially. Sony proposes a solution for this specific problem. Sharp application US20080284891 describes about yet another circuit eliminating "black sun" effect. For those who is still suffering from it, it's worth reading. ISSCC 2009 program just has been published (even though the page is still empty, clicking on "Press" drop down menu and choosing "Advanced Program" works). This year one of the pre-conference forums is devoted to Medical Image Sensors, quite interesting stuff. There are many interesting ideas to be presented on the Imagers session. The most interesting to me is Toshiba 8MP sensor. A 1/2.5-inch 8Mpixel CMOS image sensor employs a staggered shared-pixel architecture to suppress Gr/Gb sensitivity imbalance. It also employs an FD-boost operation using the Cgs and Cgd of amplifier transistors to yield large FD capability and low dark random noise. It achieves a Gr/Gb sensitivity ratio of 99.7%, random noise of 2.6erms and a pixel capacity of 7.7ke-. Now, when Toshiba says it, FD boost idea seems quite natural one to use. I have not heard anybody used it though. A 1/3.2-inch 3.3Mpixel CMOS image sensor is fabricated in a 0.15μm 1P3M CMOS process. A deep-photodiode-isolation pixel and PMOS column amplifier achieves 96μV/e- conversion gain, 7.2e-/s dark current at 60°C, and 2.5erms random noise. The sensor has a column-level signal-addition mode that realizes 15500e-/lx·s sensitivity (green pixel) and interlace scan. A CIF-format charge-multiplication 0.35μm 2P4M CMOS image sensor with 10μm pixel pitch is presented. It can execute charge multiplication using impact ionization of photo-generated signals within each pixel. For a significant increase in SNR at low light levels, up to 60× charge multiplication is achieved at a readout speed of 100μs/frame. and corresponding PRNUs of 0.57% or 0.68%, a video processor for correcting optical warp of up to 96 lines together with perspective adjustment, and a video overlay circuit. A 3D-integrated back-illuminated 1Mpixel CMOS image sensor tile includes a stack of 2×32-channel vertically integrated ADC chips, and requires 13.4μm of silicon perimeter to the pixel array. The tile and system connector design supports 4-side abuttability and burst data rates of 1Mpixel in 1ms. I was expecting more papers on consumer low-cost BSI sensors and small pixels, but this year ISSCC seems to omit these themes - quite strange, considering the huge efforts that industry is spending on this stuff. Fairchild Imaging presented a 4T pixel paper on SPIE Astronomical Telescopes and Instrumentation Conference, 23-28 June 2008, Marseille, France. It shows quite a conventional 6.5um pixel made in 0.18um process. What really sets it apart is a very low full well - only 1.5Ke at most. Update: As mentioned in comments, probably the full well is limited by column amplifier in high-gain mode. The pixel's native full well is probably higher, albeit the paper does not give an explicit number. Update #2: Two sentences removed, as said in comments. Advanced Imaging Magazine publishes Cypress article on sensors for holographic storage. Basically, all the sensor requirements are speed, speed and more speed, even at expense of SNR. Yahoo: Sony is rumored to sell low resolution CCDs for medical applications for hundreds of dollars each. Many other companies dream to penetrate to this market too. Omnivision announces its second generation medical sensor. The OV6930 square sensor has a resolution of 400 x 400. The new sensor is based on 3um 4T pixels, has optical format of 1/10 inch and a packaged footprint of 1.8 mm x 1.8 mm. The sensor's size and high low-light performance enable its use in a broad scope of medical endoscopy applications including colonoscopy, gastroscopy, OB/GYN, urology and bronchoscopy. OV6930 uses a new, patent pending serial I/O, which allows for two-wire cabling up to 14 feet and contributes to its very low power consumption of 80mW with and 10mW without IO usage. It's capable of operating at 30 fps in full 400 x 400 resolution, and 60 fps at 400 x 200 resolution. The pixel sensitivity is said to be 3300 mV/Lux-second. Yahoo: Aptina announced MT9P013 5MP 1/3.2-inch image sensor based on improved 1.75um pixels. The new sensor leverages the same technology Aptina is integrating into its 1.4um image sensors. Specifically, MT9P013 sensor implements the light-gathering advancements from Aptina’s 1.4um pixel sensors. The new sensor’s low-light sensitivity improvement is 2X over the MT9P012 for binning modes. The sensor supports 720p HD video at 60fps and full 5MP resolution at 15fps. The sensor includes 2-lane MIPI, CCP2 and Parallel interfaces. MT9P013 samples are presently available with mass production scheduled for the end of January 2009. Yahoo: One clear beneficiary of Magnachip exit from image sensor business is Pixelplus. MagnaChip has completely withdrawn its appeal on the disputed process patents in Seoul High Court. Given this, the previous lower court decision that Pixelplus did not infringe any of the disputed process patents asserted by MagnaChip has become final and conclusive, and MagnaChip's patent infringement claims on the process patents will no longer be contested or remain at issue. Honestly, I've never understood the business justification of Magnachip's lawsuit. Pixelplus is a very minor player on the image sensor market. Even if convicted, it would pay an insignificant sum for the Magnachip's bottom line. To me this dispute seemed like settling some personal scores between people in the companies. After all, both Magnachip and Pixelplus people worked together at Hyundai Semiconductor and LG Semiconductor. May be some of them think that their ideas were stolen and look for punishment. Yahoo: At Intertech-Pira Image Sensor 2008 conference in San Diego, DxO Labs today unveils www.dxomark.com, a new website claiming to present objective metrics of sensor performance for a variety of cameras measured directly on the RAW image. “There are many valuable resources reviewing the image quality of digital cameras, but none of them consider the actual RAW signal straight from the camera sensor,” explains Nicolas Touchard, VP Marketing, DxO Labs Image Quality Evaluation business. At first I liked the idea, but after a brief look on the web side, the proposed metrics look to me partially wrong and partially unnecessary complicated. I can understand the rationale behind Nokia SNR10 figure to measure sensor's low-light performance. It represents the minimum illumination to achieve SNR10 after color correction matrix (CCM) bringing sensor's colors to the standard set. Being incomplete as it is, SNR10 figure is simple to use and compare. Talking about DSLR sensors, I would complement it by SNR100 or SNR200, for example, showing the minimum illumination to get near perfect picture with standard colors. Such a simple figure is full of omissions, but it's very synthetic it terms it combines a lot of sensor parameters in a single, simple to use number. Back to DxO approach, there is no such a good synthetic number as SNR10. It's more complex as there are few different numbers making it harder to compare. For example, what if "color depth" figure is excellent, but colors are wrong and suffer from metamerism? Talking about DR and ISO measurements, how do they compare visibility of different noises? One sensor might be dominated by nicely scattered Gaussian noise, other might have mostly row or column noise, yet another one might suffer from "salt and pepper" noise. All these noises have very different visibility. Not that Nokia SNR10 has less problems, but at least it's much simpler and much more synthetic. So if I would propose DSLR sensor metric, I would go for SNR100 measured according to Nokia procedures. What I liked though is the database with quite a detailed measured data. The pure measured data is really valuable. Kudos to DxO for making this openly available! "Although inventory levels generally tend to serve as a moderating factor to the purchase of new devices, in the case of the new CMOS image sensor the OEMs that did not have it found that they were stuck with their inventories of non 3-D devices. Meanwhile, those who were able to acquire and use them made a considerable profit based on the architecture’s smaller form factor." Micron application US20080265295 talks about making a deep red pixel in Bayer pattern, while green and blue pixels are shallower. This might be a useful idea for old simple 3T pixels, but Micron is going to apply it to 4T design. The problem with it is that essentially Micron has to optimize two different pixels in the same sensor, including dark current, image lag, full well, etc. All these are long and hard optimizations, requiring many trade-offs. Having two different pixels to optimize certainly does not help in this. Application US20080265348 was filed by Philips in May 2005, right before the image sensor group was acquired by DALSA. It contains quite a detailed description of manufacturing steps of backside illuminated imager. It appears that Philips experimented with CMOS BSI well before the acquisition. At the time when everybody worries about tomorrows markets, Kingpack makes a brave move and expands its image sensor packaging capacity. Digitimes reports that Kingpak Technology, a member of the Kingmax Group, has set a goal to expand its monthly capacity for image sensor packaging and testing from 2-3 million units to 4 million mark. Sales from the CIS packaging segment account for 60-70% of Kingpak's total revenues at present, said the company. For CIS applications, Kingpak's customers include Micron, Logitech, Chicony, KYE and Quanta, Digitimes sources indicated. The Toshibe VGA sensor ‘Through Silicon Vias’ TSV reverse engineering report, jointly published by Chipworks and Yole Developpement, analyzes the technology and economics behind Toshiba’s latest Image Sensor. The new report features three different chapters presenting a technical analysis by Chipworks and a reverse costing analysis and the TSV market perspectives by Yole. Akihabara News, Electronista report that Sony announced 12, 8 and 5MP sensors and camera modules featuring the new 1.4um pixels. 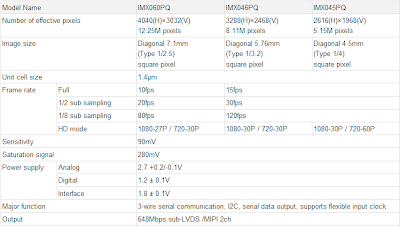 As far as I was able to understand the original Sony Japan announcement, translated by Google, 1/2.5-inch IMX060PQ 12.25MP and 1/4-inch IMX045PQ 5.15MP sensors start sampling in March 2009, while 1/3.2-inch IMX046PQ 8.11MP samples are available in November 2008, that is now. IU060F 12.25MP camera module sampling begins in September 2009, while IU046F 8.11MP module sampling starts in February 2009. The modules have piezoelectric AF, F2.8 lens and 28mm and 32mm equivalent focal length for 12MP and 8MP models respectively. Regarding the technology, Sony only tells about Cu wiring and column-parallel ADCs used in the sensors. 12MP sensor speed is 10fps at full resolution, while 5MP and 8MP ones have 15fps full resolution speed. All sensors have 1080p/30fps and 720p/30fps HD video modes (except 12MP one having only 27fps in 1080p mode and 5MP one having 60fps in 720p mode). The new 1.4um pixel sensitivity is said to be equal to one of 1.75um pixel. The sensor's interface is 648MHz 2-lane MIPI and sub-LVDS. Supply voltage is a triple combination of 2.7V for analog, 1.2V for digital and 1.8V for interface (1.8V is probably needed to adopt sub-LVDS voltage levels). Update #2: Here is the official Sony PR in English. Yahoo: Kodak Company promoted Terry R. Taber to the position of Chief Technical Officer, effective Jan. 1, 2009. Taber, who joined Kodak in 1980, is currently the Chief Operating Officer of Kodak’s Image Sensor Solutions (ISS) business. Prior to joining ISS almost two years ago, Taber, a Ph.D. in Organic Chemistry from Caltech, mainly dealt with silver halide side of Kodak business. Centre Daily Times: The Strategy Analytics Wireless Device Lab service research, "The Camera is Still King: Consumers Willing to Pay for a Quality Camera on Their Mobile Device," shows that a quality camera is the primary mobile phone add-on for which consumers in the U.S. and Western Europe would be willing to pay--and willing to pay the most--compared to other mobile device features. These findings are based on a survey of over 2800 wireless device owners in the US and Western Europe. "Strategy Analytics research shows that over 60% of all respondents would be willing to pay extra for a quality camera on their mobile device," commented Chris Schreiner, Senior User Experience Analyst at Strategy Analytics. "This desire for imaging features prevails across all age ranges in both regions." Digitimes sources tell that Seti's shipments of VGA image sensors for white-box handsets in China have climbed to 10M units per month. This represents about 50% of Chinese market, according to Digitimes sources. Seti achieved this by setting aggressive ASPs, bringing VGA sensors to below US$1 in June. Such a strategy puts additional pressure on Omnivision to keep its share on the Chinese market. "the wafer-level packaging, wafer-level optics, and wafer-level camera, the average amount of time to get in production and revenue varies according to the nature of the licensee’s facility, their experience, and the technologies being licensed. If a licensee has an existing facility, it can take up to one and a half to two years after licensing for royalties to start. If the facility needs to be built from scratch, it takes longer, up to an additional six to nine months. For technologies like our smart optics, it can take one to one and a half years from licensing to royalties." "In wafer-level packaging, during the third quarter, we announced the second licensee of our SHELLCASE MVP technology, AWLP, based in Seoul, Korea." "Our first SHELLCASE MVP licensee, Nemotek, is scheduled to be sampling customers in the first quarter of 2009." "Our first example of our technology integration comes through our product launch services, which we announced on September 22nd. These product launch services offer a combination of technology and resources from our Tel Aviv and Charlotte facilities." Yahoo: Tessera announced today that Q Technology Limited (Qtech) has licensed Tessera’s SHELLCASE MVP wafer level TSV-based image sensor packaging technology. Qtech, based in China, manufactures compact camera modules for cell phones, notebook computers and security and protection markets. Japan-based THine and Taiwan-based Winbond announced that the two companies agreed to transfer Winbond’s ISP Business to THine. The revenue of Winbond's ISP business in fiscal year 2007 was NT$323 million. Its ISPs is intended to wotk with 3MP to 5MP sensors and AF actuators for smart phones or high-end feature phones. THine’s intends to use ISP in applications for security cameras, automotive camera systems, amusement machines as well as cell phone handsets and mobile gadgets with cameras. Yahoo: Omnivision's OV9710 is claimed to be the first megapixel CMOS image sensor designed specifically for automotive vision and sensing systems. Megapixel sensors are the next wave in automotive vision systems, enabling the adoption of advanced forward-looking and extreme-wide angle applications. Initial interest in the OV9710 is said to be strong, and it is currently sampling with multiple automotive customers. The OV9710 is a 1/4-inch sensor providing full-frame, sub-sampled or windowed 8-bit/10-bit images in raw RGB format via the digital video port. The sensor delivers full-frame video at 30 fps and VGA resolution at 60 fps. The OV9710 incorporates image processing functions, including: exposure control, gain control, white balance, lens correction and defective pixel correction. The OV9710 is suitable for wide angle vision systems, such as bird's eye view applications and for advanced parking assistance systems. "Megapixel resolution is critical for extreme wide angle (greater than 160 degrees) applications, such as 360 degree view multi-camera systems, where distortion correction and image stitching is required," said Inayat Khajasha, Senior Automotive Product Marketing Manager at OmniVision. "VGA cameras simply cannot address electronic (on - or off-chip) distortion correction beyond 130 degree angles because they result in stretching and blurring the image, which can seriously compromise driver and passenger safety." The OV9710 is currently available for sampling while mass production will be ready by the end of the second quarter of 2009. Yahoo: Aptina claims a major improvement in low light sensitivity with its new VGA SOC MT9V136 image sensor. The sensor’s image processing engine include auto white balance and auto exposure functions and lens alignment functionality for ease of manufacturing. The MT9V136 also integrates NTSC/PAL encoder for analog video and progressive scan digital output at 60fps, programmable On-Screen Display (OSD) capability, and flash interface. The MT9V136 is sampling at this time and is scheduled to be in mass production early Q4 2008. Sigma officially reported that it has acquired 100% of the stock of Foveon. Foveon will continue its sensor development operations in San Jose, CA. The acquisition of Foveon will enhance the development of new types of image sensors and create a synergistic effect with Sigma’s camera and lens business by improving the integration between the camera and sensor. Yahoo: As stated by the recent report published by Global Industry Analysts, the world market for image sensors is expected to average to $11.7 billion by the year 2012. Currently the market is dominated by Asia-Pacific, Japan, and United States collectively accounting for 79.5% share as estimated in the year 2008. The world CCD image sensors market is projected to witness declining demand, with the market value expected to deteriorate by US$369.9 million between the period 2008 to 2012. Japan and Asia-Pacific are expected to witness the steepest fall in sales during the aforementioned period. Growth in the world market is fashioned by the CMOS image sensors market, which is projected to witness strong double-digit growth rates. Global sales in this market are expected to rise by US$4,297 million between the period 2008 to 2012. In Europe, France and Germany, together, collar over 54.2% of the image sensors market as estimated in 2008. Increased competition from China and Taiwan is resulting in falling average prices of image sensors. Adroit utilization of fully depreciated fab lines for manufacturing image sensors is enabling Asian players to offer products at competitive prices to OEMs. 20MP Mobile Imagers in 2012? Tech-On: Ericsson AB of Sweden revealed its efforts in LTE mobile standard promotion at a press conference Nov 6, 2008. During the conference, Ericsson mentioned its concept of a future mobile terminal as "a mobile device in 2012." According to the concept, high-function terminals, in the future, will be equipped with a 12- to 20MP camera and support full HD video shooting capability. Assuming the "2012 mobile device" has 1/3" sensor, this translates to 1.1um (12MP) or 0.8um (20MP) pixel pitch. As for 1.1um pixel, it's probably safe to assume that it will be mass produced sometime in 2012. I'm less sure about 0.8um generation. Probably Ericsson AB is more optimistic than me on the time table of the image sensor industry. One needs a real leapfrog to make 0.8um in 2012. It came to my attention there is a new 3D imaging startup in Switzerland, called Mesa Imaging. The company was founded in 2006 as a technology spin-out from CSEM (Centre Suisse d'Electronique et de Microtechnique). The imager gets 3D information using time-of-flight distance measurement principle. Infrared light from the camera's internal lighting source is reflected by objects in the scene and travels back to the camera, where its precise time of arrival is measured independently by each of the sensor pixels. A unique CCD/CMOS imager is in the heart of the camera. The sensor has a fast electronic gate and CCD-like storage area to achieve precise time measurements. With Mesa Imaging arrival, there are 4 start-ups dealing with time-of-flight imaging. The 3 others are 3DV, Canesta and PMD. Also, Panasonic develops a CCD for 3D sensing. The differences between all these approaches look quite subtle to me. All talk about necessity of background light suppression and all claim to solve this problem. All companies tell they are cheap enough for the mass market. I hope the 3D time of flight market is big enough to accommodate all five of them. I got this rumor from two independent sources, both telling that Sigma has acquired Foveon more than three weeks ago. Right before the acquisition Foveon has laid off about a half of its staff, including VPs and CFO. Apparently, the layoff was associated with the closure of mobile image sensor project - the flagship Foveon project in the recent years. The mobile sensor had 2.2um pixel size with 3-layered photodiodes. Its resolution was supposed to be close to 1.4um pixel, given same physical size of the sensor array. However, Foveon image processing was too heavy for the current mobile phone processors. Foveon's foundry Dongbu used to provide excellent support, in hopes that Foveon would be successful on the huge mobile sensor market. Now, with no cellular project, the support might be downgraded, which complicates the new sensors development. All the above are unconfirmed rumors. Like any rumors, you should take these with a grain of salt. Mobile Handset Design Line publishes a third part of "Image capture and processing challenges and solutions in portable designs". What I thought was the part 3 before is probably not a part of the series. In the new part Tessera talks about how great is software enhanced optics and the new possibilties it opens, including full optical zoom with no moving parts, extended field depths, and small F-number optics for low-light environments. Yahoo: Cypress announced sampling of a 3MP 8um pixel image sensor with industry-leading digital data throughput of 13.2 Gbps. The new 3MP LUPA-3000 sensor offers a triggered and pipelined synchronous shutter with a frame rate of 485fps. The pipelined synchronous snapshot shutter allows reading one image while the next is being acquired. The sensor has 32 8-bit digital LVDS outputs, each runs at a 206 MHz pixel rate. “The high-speed LUPA-3000 sensor opens up the holographic data storage market to our industry leading portfolio,” said Cliff Drowley, vice president of Cypress’s image sensor business unit. Cypress also announced LUPA-1300-2-color 1.3MP sensor with 14um pixel size, pipelined synchronous shutter and 12 10-bit digital LVDS outputs having a programmable offset and gain amplifier for each channel of the LVDS outputs. Each channel runs at a 61MHz pixel rate, which results in 500fps frame rate at full resolution. Prototype samples of the LUPA-3000 and LUPA-1300-2-color sensors are available now with production devices expected in the first quarter of 2009. Ad Hoc News: Scalado has signed a contract with Samsung to license and integrate Scalado SpeedTags technology into Samsung future mobile multi-megapixel SOC designs featuring 3MP and above. With Aptina and Omnivision announced similar agreements some time ago Scalado SpeedTags get quite a broad support. Arasan announced availability of MIPI IP blocks portfolio. Half a year ago there was a brief message about that. Now Arasan reveals much more details. Arasan’s Camera Serial Interface CSI IP cores are compliant with MIPI CSI-2 specification 1.0 addressing all Tx/Rx requirements. Arasan’s highly configurable CSI IP cores are architected to support 1 to 4 lanes providing up to 4 Gbps throughput. They can support a variety of native host interfaces – APB, AHB, AXI, OCP, Micro-Controller or customer specific interfaces, providing seamless integration to any camera sensor or image processor. Optionally, the IP cores also support compression/decompression with predictor algorithms. The Arasan CSI-2 IP cores are readily available and have been integrated into several customer designs. Arasan claims it's the first on the market with MIPI IP blocks, but Mixel also announced such an IP many months ago.